The group Djeli Sira which literally translates to “the path of the griot” is a group made up of master drummers and dancers from the ancient Mandingo Empire of West Africa. True to its name, Djeli Sira preserves the roots of the Malinke griot tradition. The griot, or djeli, is the oral historian of the people, transmitting history, culture and values from generation to generation. 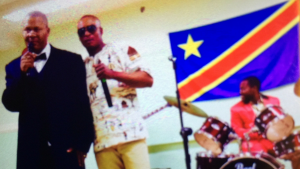 Just like their ancestors, Amadou Kienou and Djeli Sira also create contemporary music which reflects current circumstances. Through music, voice, and dance, they express the profound emotions associated with these ancient revered traditions. This cultural expression has a universal appeal and touches the hearts of audiences worldwide. 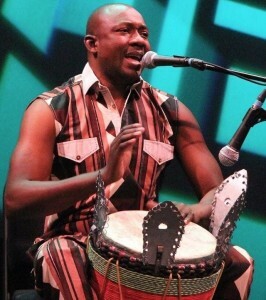 Get ready to be moved to the rhythm of the Djembe! For the last 25 years, Jah Cutta also known as “the lion” and the “king of reggae,” has lit up stages with his legendary reggae reputation. 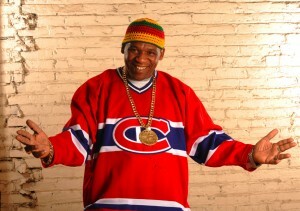 Originally from Jamaica, he’s now a Canadian reggae figure whose early successes overseas has led to his success at home in Montreal. Renowned for his ferocious live performances, Jah Cutta has shared the stage with some of music’s greatest entertainers and collaborated with the top names in the genre such as Peter Tosh, The Wailers and Gregory Issacs. For him, music is a mission: bring listeners up and bring joy into their lives. He wants to bring people together and put a smile on the faces of the poorest people in the world, and call people to work together to address the inequalities. 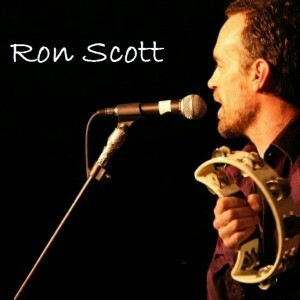 Ron Scott claims that The Lost Souls are the spirits of all the musicians that he has performed with over the years. Today Ron performs with a looper and is able to bring to life a variety of styles of music using the digital multitrack device to fill out the arrangement. Harmonizing with his own voice and building vocal and instrumental arrangements live and in real time, presents audiences with something of a musical riddle. Using acoustic guitar, djembe, synthesizer and voice, Ron Scott and The Lost Souls are an invisible group that never fails to entertain. Get carried away by the smooth rhythms and positive vibes! 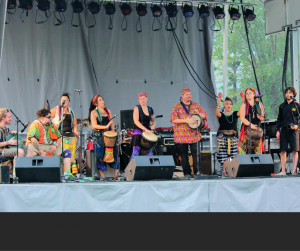 drum beats, didgeridoo, singing, dancing…A fusion of lively dance, traditional drum beats and contemporary grooves. Tribal Vibes Wild Fire is all about; peace, love, unity and respect!!!! 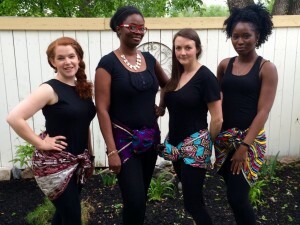 Afro Sepo was formed in 2014 by a group of African and North American women that wanted to bring diverse forms of African dance to Regina audiences. The word ‘sepo’ is a Yoruba word that means to mix, associate or do together. 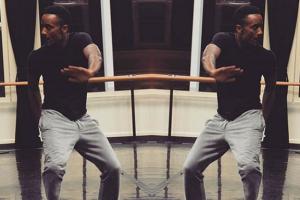 To date dance influences come from Congo, South Africa, Zimbabwe, Guinea, Nigeria and Ghana, and the group is always looking for new inspiration. Today’s performers are: Funke Omole, Funke Okochi, Cosanna Preston-Idedia, Zuri Epp and Kweira Quaye. Drums are the heartbeat of mother earth. We are all embraced in the rhythm from culture to culture around the world. 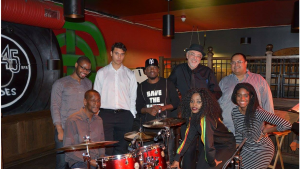 Coming later in life to drumming through a friendship with West African Master Drummer Joseph Ashong, Joanne has also experienced drum influences of Cuba and Brazil. As well, Advanced Facilitation with Cameron Tummel and certified as a DRUMBEAT therapeutic drumming instructor. Not born or steeped in a drum culture this has been a journey of exploration in rhythm and in the connection of rhythm to communication and community. 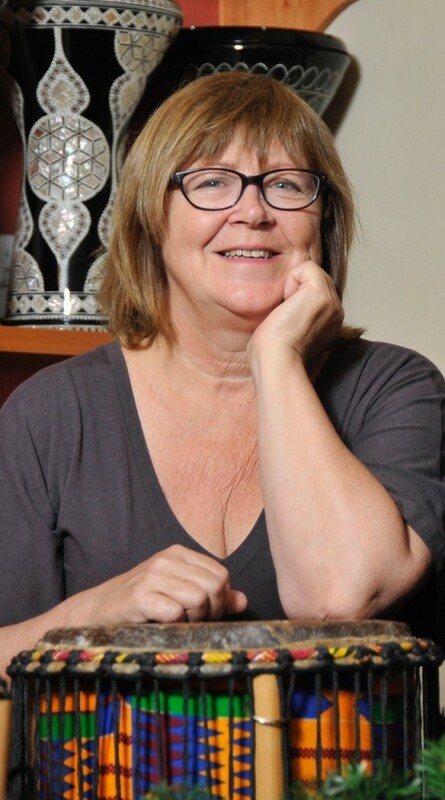 Founder of Cathedral Village Drum Circle 1996, Chair of major drum events including Heartbeat – Grey Cup 1995, Cathedral Arts Festival Drum Extravaganza, Ba Da Boom, Children’s Festival shows Odyssey and Beauty and the Bog, and the Drumming the Village, a youth drum festival. Performed with traditional West African instruments in The Ghanadians with master drummer Joseph Ashong and husband Victor Tiede. 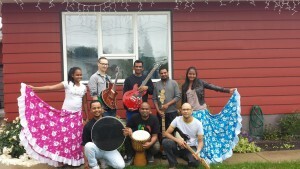 Performed in Skin & Bone, Bandja, Jambalay, and the Tuesday Night Jam, supporting multi-cultural fundraisers for education, women’s health, and aids in Africa, and Cancer research, prevention, and treatment in Saskatchewan. 1801 Retallack St. Regina, Sk. 306- 537-7181. 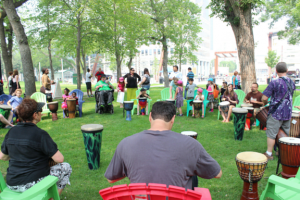 Drums and small percussion for Schools, community, and professional musicians. .. .Quotes on request.. .